The Cardologists played with waterbrushes this week. 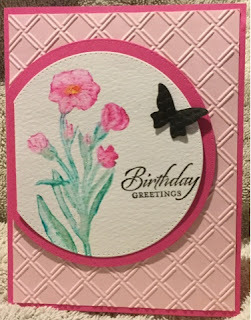 For this technique we used an open flower stamp from Stampin Up's Butterfly Basics. We stamped the image with Marvy markers onto watercolor paper. The waterbrushes then pulled the color into the image. This technique is so cool because no two ever come out the same. All depending on the amount of water used, a little color can be pulled in or lines can almost disappear. 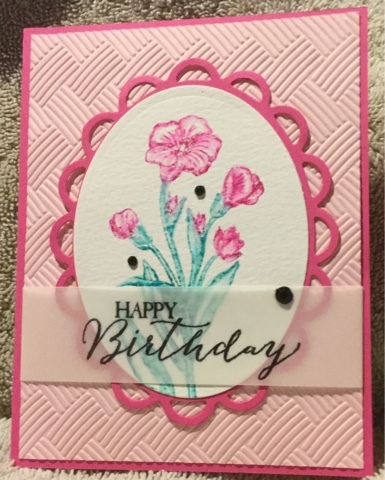 I couldn't decide which die I wanted to use - Lola's Memory Box circle dies or Jules' Spellbinder's ovals - so I did a card with both. This first card went to a new worker in our office who has a birthday Monday. Notice the stitching that the inside circle die has. A Cuttlebug lattice folder and a Stampin Up butter fly and sentiment finished the card. This second card had less of a watercolor look since I left more lines and white areas. The background is a Darice basketweave folder I used a (new to me) Ranger black archival ink to stamp on vellum and was pleased that it dried quickly. Hope my friends on the East coast, buried in snow, are safe and warm. So happy we did not get any this time! Thanks for visiting. Love to hear from you.